Medical devices that can be ingested or implanted in the body could offer new ways to diagnose, monitor, and treat diseases. In their study, the researchers tested a prototype about the size of a grain of rice, but they anticipate that it could be made smaller. Giovanni Traverso, a research affiliate at MIT’s Koch Institute for Integrative Cancer Research, is now working on a variety of ingestible systems that can be used to deliver drugs, monitor vital signs, and detect movement of the GI tract. In animal tests the researchers have shown that the radio waves can power devices located 10 cm deep in tissue, from a distance of 1 m. Until now, this has been difficult to achieve because radio waves tend to dissipate as they pass through the body. To overcome that, the researchers devised in vivo networking (IVN), a system that relies on an array of antennas that emit radio waves of slightly different frequencies. As the radio waves travel, they overlap and combine in different ways. At certain points, where the high points of the waves overlap, they can provide enough energy to power an implanted sensor. 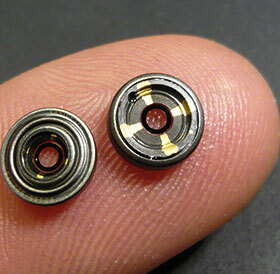 The liquid lens is a very small lens device, now most commonly used in iPads and mobile phones. To a keen photographer, the picture quality produced from such a small lens is unbelievable. The liquid droplet forming the lens has its shape changed using an electronic control system, which is able to change focal length (to focus) and optical axis (for optical image stabilisation, ie to reduce camera shake effects) all within a few milliseconds. The idea for this invention came from research on the phenomenon known as ‘electro-wetting’ by Professor Bruno Berge, in Lyon, France. The professor has been working on liquid interfaces since 1991 at the Ecole Normale Supérieure in Lyon. A drop of water affected by electro-wetting can function as a variable magnifying glass: so two clear, non-miscible liquids of the same density, one being electronically controlled water, can serve as a lens, depending on the curvature of the interface between them. In the finished lens, the two liquids are sealed and held in a metal casing that is typically smaller than 10 mm in diameter. Berge first approached Canon with the invention, but attracted no funding. So with French state-funding plus some investment fund backing, Berge founded the company VariOptic in 2002. In 2007 they established a production line in China, and in 2009 the first industrial barcode reader with a VariOptic lens appeared on the market. Machine vision manufacturer Cognex was an early adopter of the technology, for barcode ID readers. A new component now available from IDS (Imaging Development Systems) is a single board USB interface camera module, available for use with and control of liquid lenses, which IDS supply. These low-cost uEye LE industrial cameras with twist-proof USB connection and practical USB power delivery are suitable for logistics systems e.g. for package acceptance and sorting, for microscopy and traffic monitoring, as well as for installation in small medical or industrial devices. As an avid aero-photographer, using long and heavy telephoto lenses, I am still waiting for a lightweight telephoto ‘liquid lens’ for my Canon camera. But I also use antique, 200 year old telescopes to spot aircraft – they are as good as modern optical devices, and better made. I did mention to Prof Berge, that one of my favourite telescopes, dating from the 1790s was made by Matthew Berge, his namesake! Why you might want to bypass the DCS and scada systems. Siemens researches the value of digitalisation to manufacturers.